Snacks! Not what we should be encouraging our kids to eat surely? Well most nutrition experts agree that snacking is part of a healthy diet. Kids especially need a regular top-up of energy to replace what they use in the adventure of everyday life. Kids have small stomachs but big appetites! And that top-up should be as healthy as possible. A healthy snack should add something- as well as energy – to a child’s diet. That could be anything from vitamins e.g. vitamin C from an orange, to fibre e.g. from a slice of wholemeal toast. Low-fat cheese and meat – not processed – are also useful snack-builders. Good to dip into while watching television and so full of nutritious goodies, this bag practically walks by itself! An airtight bag. Most supermarkets sell resealable plastic sandwich bags that are ideal for this. Take a handful of each ingredient and toss them together in the bag. Don’t give nuts or nut butters to children under 5 years of age, as they can cause allergic reactions or be choking hazards. 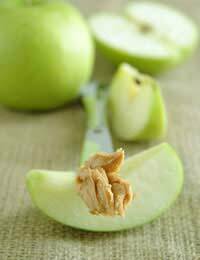 Cut an apple into chunks and spread with peanut butter – a good source of protein – for another very simple snack. Put the cheese into a microwavable bowl and heat on a low setting until it’s soft and runny. Use as a dip for the fruit, vegetable and bread sticks. Lightly toast the bread on each side. Cover one side with grated cheese, and draw a smiley face in tomato ketchup. Pop it back under the grill for a minute or so to allow the cheese to melt and bubble. As the kid’s tastes develop, they can experiment with more adventurous snacking. Lightly cover each side of the bread with the spread. Peel the garlic clove and cut it in half. Rub it over both sides of the bread. Place on a baking tray and cook for 15 minutes. Peel and chop the onion into very small pieces. Mix with the tomatoes, some shredded basil leaves and a sprinkling of pepper. When the bread has been cooked for 15 minutes, remove it from the oven. Share out the tomato mixture putting some on each slice of bread. Return to the oven for another 5 minutes. Using a knife, slice open one side of the pitta bread. Put some lettuce in the bottom, followed by meat and sauce, and then top with a sprinkling of grated cheese. You can use tomato ketchup or chutney in place of salsa sauce.